Legend has it that Queen Elizabeth I danced around the garden of Ye Olde Mitre in Holborn with Sir Christopher Hatton, the man who gave his name to Hatton Garden, from which a narrow passageway leads to this pub. Described as the hardest pub to find in London, it is certainly worth the time spent searching. The Mitre Tavern was initially built for the servants of the Bishops of Ely (the pub’s former owners) in 1547, but the building as it currently is has only been around since 1772. 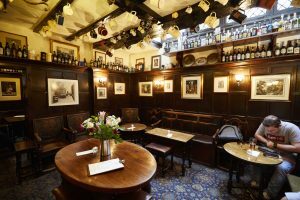 Frequented by Charles Dickens when it was a coffee house, and mentioned in his novel ‘Little Dorrit’, The George Inn is London’s last standing galleried inn – meaning that it has historically served as a resting point for travelling horse-riders and coaches. There is evidence to suggest that there has been an inn on the site since Medieval times, though the current building only dates back to 1677. Open since 1585, The Spaniards Inn is another establishment that was visited by the famous Charles Dickens, who claimed to have found the place utterly inspirational. With its real wood fire and dark, atmospheric interior, the place has the feel of a truly historic site, which it is. All that has been modernised about The Spaniards Inn is the food menu, which offers fresh, seasonal reinventions of classic pub meals. After the Great Fire of London in 1666 ruined most of the city, much of it had to be rebuilt, including, of course, many of its beloved pubs. Ye Olde Cheshire Cheese is one of these pubs; originally having opened in 1538, it was rebuilt in 1667 following its fiery demise. The Cheese’s biggest assets are it’s cellars, which are thought to have been part of a 13th Century Monastery, and which offer extra seating to customers, making the place much more spacious than it seems.